HONG KONG (Reuters) - Vietnam will soon have a credible naval deterrent to China in the South China Sea in the form of Kilo-class submarines from Russia, which experts say could make Beijing think twice before pushing its much smaller neighbor around in disputed waters. A master of guerrilla warfare, Vietnam has taken possession of two of the state-of-the-art submarines and will get a third in November under a $2.6 billion deal agreed with Moscow in 2009. A final three are scheduled to be delivered within two years. While communist parties rule both Vietnam and China and annual trade has risen to $50 billion, Hanoi has long been wary of China, especially over Beijing's claims to most of the potentially energy-rich South China Sea. Beijing's placement of an oil rig in waters claimed by Vietnam earlier this year infuriated Hanoi but the coastguard vessels it dispatched to the platform were always chased off by larger Chinese boats. The Vietnamese are likely to run so-called area denial operations off its coast and around its military bases in the Spratly island chain of the South China Sea once the submarines are fully operational, experts said. That would complicate Chinese calculations over any military move against Vietnamese holdings in the Spratlys or in the event of an armed clash over disputed oil fields, even though China has a much larger navy, including a fleet of 70 submarines, they added. "Sea denial means creating a psychological deterrent by making sure a stronger naval rival never really knows where your subs might be," said Collin Koh of Singapore's S. Rajaratnam School of International Studies. "It is classic asymmetric warfare utilized by the weak against the strong and something I think the Vietnamese understand very well. The question is whether they can perfect it in the underwater dimension." Vietnam is not wasting time getting to grips with its biggest ever arms purchase, the centerpiece of a naval expansion program that state media has kept largely under wraps. From the sheltered harbor of Cam Ranh Bay - home to a massive U.S. military base during the Vietnam War - the first two submarines have recently been sighted plying the Vietnamese coast on training runs, according to regional diplomats. A Vietnamese crew is training aboard its third Kilo in waters off St Petersburg ahead of its delivery to Cam Ranh Bay in November, Russia's Interfax news agency reported last month. And a fourth vessel is undergoing sea trials off the Russian city's Admiralty Shipyard while the last two are being built. While regional military attaches and experts are trying to gauge how quickly Vietnamese crews are mastering the advanced submarines, some believe it won't be too long before Hanoi starts sending them further offshore into the South China Sea. "The Vietnamese have changed the whole scenario – they already have two submarines, they have the crews and they appear to have the weapons and their capabilities and experience will be growing from this point," said Siemon Wezeman, an arms transfer researcher at the Stockholm International Peace Research Institute (SIPRI). "From the point of view of Chinese assumptions, the Vietnamese deterrent is already at a point where it must be very real." As well as possessing shorter-range torpedoes, modern Kilos while submerged can launch sea-skimming anti-ship missiles that can travel 300 km (188 miles). Wezeman said SIPRI estimated that Vietnam had received at least 10 of the 50 Klub anti-ship missiles this year as part of the deal with Moscow, but there was no sign of any purchases of the Klub land-attack variant. Zhang Baohui, a Chinese security specialist at Hong Kong's Lingnan University, said he believed Beijing's military planners were concerned about the submarines. "On a theoretical level, the Vietnamese are at the point where they could put them to combat use," he said. Neither China's Defense Ministry nor its Foreign Ministry responded to a request for comment. Senior Vietnamese military officials told Reuters they were satisfied with progress, saying training at sea and integration of the submarines into its developing naval force was going smoothly. They stopped short of confirming whether the first two were fully operational but stressed they would be used "defensively". "They are not our sole weapon, but part of a number of weapons we are developing to better protect our sovereignty. 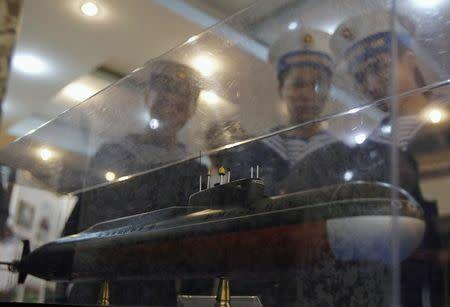 In that regard, the submarines will be defensive," said one military official in Hanoi who declined to be identified because of the sensitivity of the matter. That echoes public comments from Deputy Defence Minister Nguyen Chi Vinh who has repeatedly stated, without mentioning China directly, that Vietnam would not start a conflict in the South China Sea but if one began "we would not just stand back and watch". Vietnam – a traditional army power – has significantly expanded its navy in recent years, acquiring modern frigates and corvettes, mostly from Russia, that are equipped with anti-ship and anti-submarine weapons. Hanoi has also embarked on a building program of ships based on Russian designs. Vietnam and China have a bloody history, fighting a brief border war in 1979. They clashed at sea in 1988 when China occupied its first holdings in the Spratlys. China also took full control of another South China Sea island chain, the Paracels, after a naval showdown with the then South Vietnam in 1974. Former Western submariners watching developments said they were impressed with the apparent progress despite the enormity of the challenge for Vietnam in developing a submarine capability from scratch. By comparison, the Philippines, the other country most at loggerheads with Beijing in the South China Sea, has no submarines or modern naval surface ships or significant naval aircraft. Even before Vietnam took delivery of its first Kilo in January, Vietnamese submariners had been receiving training in Russia, Hanoi's Cold War-era patron. India's navy is also training Vietnamese crews at its INS Satavahana submarine center in Andhra Pradesh state, an Indian naval official told Reuters. India has operated Kilos since the mid-1980s. "It is not just about learning basic operational considerations, it is about the doctrine and tactics of how best to exploit these vessels – and making sure you've got a long-term program to build all this up," one Western submariner said. The diesel-electric Kilo is considered one of the quietest submarines and has been constantly refined since the 1980s. Vasily Kashin, a Moscow-based strategic analyst, said he believed Vietnam's Kilos were more technologically advanced than the 12 such vessels operated by China's navy, which obtained its last one a decade ago. Internal sound absorption had been improved, along with weapon control and loading systems, he said. Open source satellite images have shown Kilos alongside new Russian-built submarine wharves at Cam Ranh Bay, as well as a new dry dock for repairs. A medical facility for submariners has also been completed nearby, according to Russian media reports. Russian personnel are also stationed at a new Russian-built training center in Cam Ranh, which includes simulators of control, navigation and weapons systems. U.S. forces used the bay's sheltered features to build a vast airport and logistics base at the height of the Vietnam War in the 1960s, when Cam Ranh was part of the then South Vietnam. By late 1978 it was in Soviet hands, as a victorious Hanoi signed over base rights to Moscow. In disrepair through much of the 1990s, the Russians could not negotiate an extension and departed in 2002. Across the harbor from the sensitive submarine facilities, the Vietnamese are expanding ship repair yards they hope will attract a range of foreign navies at commercial rates. The U.S. navy has sent several logistics ships for servicing but a more formal arrangement has yet to be agreed. Former Western submariners say Cam Ranh's location is perfect for Vietnam's Kilos. Not only is it the closest large port to the Spratlys to the south, it is also within range of the Paracels. And while much of the South China Sea is shallow and presents difficult operating conditions for submarines, Cam Ranh is close to some of the deeper water off the edge of Vietnam's continental shelf. "No-one should underestimate the Vietnamese – they have a clear threat and that gives them an extra incentive," said Wezeman of SIPRI.